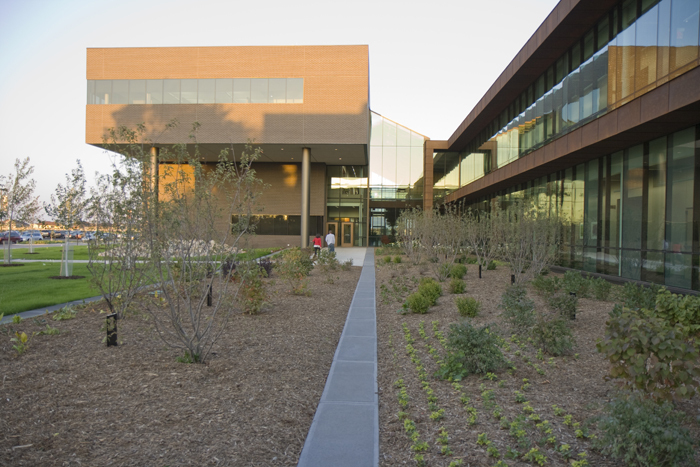 The owner of this overcrowded campus needed two new buildings to accommodate a growing workforce. Structural steel was chosen as the best system to accommodate a modernistic architectural design, which demanded significant cantilevers, large suspended areas of wall, and long spans supporting glass and other visual light elements. An extremely cold climate and clay soils with low bearing strength were also factors in choosing steel. 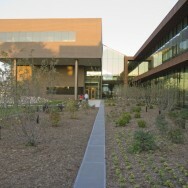 The Office building is configured in two parallel pieces called “bars” with a large glass atrium between them. The Amenities building is a relatively rectilinear cafeteria/kitchen area on the ground floor with a variety of meeting spaces and outdoor terraces above it. An adjacent tall, single-story dining area surrounded with glass in a triangular shape renders the building more or less trapezoidal in plan. Design and drafting of these buildings overlapped significantly with fabrication and construction. Constant communication with the contractor was necessary in order to deliver design for what was to be built next. The “just in time” concept became part of MBJ’s vocabulary to reduce contractor downtime and engineering re-design while allowing the architect’s vision to emerge. Read more about the project in “Growing an Office on the Plains,” Modern Steel Construction, December, 2010.